Break almond paste into small pieces; place in food processor. Add sugar; process until mixture is texture of coarse meal. Add corn syrup and almond extract; process until blended. Test with 1 tbsp. of mixture, rolling between palms. If mixture is crumbly, add additional corn syrup, by teaspoons, until mixture holds together. 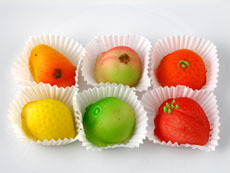 Tint with food coloring paste by breaking off a piece of marzipan and kneading in desired color. Using cookie cutters, marzipan can be rolled out and cut into decorative shapes. Have confectioners' or powdered sugar spread out on a sheet of waxed paper nearby. To prevent sticking, dip cookie cutters or hands into sugar frequently.